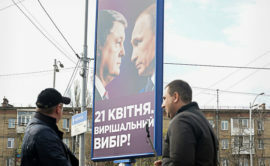 While Ukraine currently faces a difficult choice for its leadership, Russia has settled on President Vladimir Putin, the Kremlin said Wednesday in response to campaign billboards depicting Ukraine’s president facing off against Putin. Posters showing Ukrainian President Petro Poroshenko opposite Putin with a caption reading “The Decisive Choice” appeared in Ukraine ahead of the country’s second-round runoff vote on April 21. The incumbent will face comedian and actor Volodymyr Zelenskiy, who despite his popular anti-corruption message has been accused during the campaign of being the puppet of a rich businessman whose television channel airs his shows. “We choose Putin, and as for the Ukrainians — we’ll see,” Kremlin spokesman Dmitry Peskov was quoted by the RBC news website as saying when asked to comment on the use of Putin’s image in Poroshenko’s campaign ad. “But we firmly believe that Putin is dreaming of a weak, unprepared president, which will allow the Kremlin to take Ukraine under control,” Ukraine’s UNIAN news agency reported. During the first round of Ukraine’s election, Poroshenko attacked Zelenskiy as fundamentally unserious, a reckless choice at a time when the country is still at conflict against Russian-backed separatists. “[Putin] dreams of a soft, pliant, tender, giggling, inexperienced, weak, ideologically amorphous and politically undecided president of Ukraine. Are we really going to give him that opportunity?” Poroshenko said.